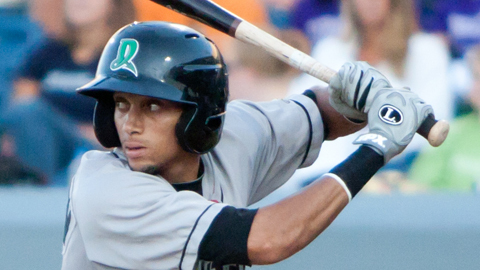 Billy Hamilton needed to average one stolen base over the Dayton Dragons' last three games to reach his goal. Instead, he took care of business in a single contest. The Reds' No. 3 prospect stole three bases Saturday to become the first Minor Leaguer with 100 thefts in a season since 2001. Hamilton wasted no time in the Dragons' 4-2 victory over the Lansing Lugnuts. After leading off the bottom of the first inning with a double, he stole third and scored on a throwing error by catcher Carlos Perez. After laying down a sacrifice bunt in the third, Hamilton was back at it in the fifth, hitting a leadoff single and stealing second and third. He scored on Brandon Dailey's groundout to give the playoff-bound Dragons a 4-0 lead. It was the seventh time this season that Hamilton -- who will celebrate his 21st birthday on Friday -- swiped three bases in a game. He accomplished the feat most recently in a 17-7 rout of Lansing on Aug. 22. The switch-hitter broke the Reds' organizational record of 98 steals, set in 1988 by Ramon Sambo of the Cedar Rapids Reds. "It's an honor -- as young as I am -- to break a record like that," Hamilton said. Selected by Cincinnati in the second round of the 2009 Draft out of high school, he recorded 48 stolen bases in 69 games for Rookie-level Billings last season. The Mississippi native is the 12th Minor Leaguer ever and the first in a decade to reach the century mark. The last player to accomplish the feat was Peoria's Chris Morris, who stole a Midwest League-record 111 bases in 2001. With only two regular-season games remaining, it's unlikely that Hamilton will catch Morris. But he's not about to stop running. "Every bag after this is a bonus stolen base," he explained. "I'm going to keep going and try to get as many as I can." Hamilton admitted to pressing a bit with the season winding down. "[Manager Delino] DeShields talked to me about relaxing and just trying to get on base a little more," he said. "I was thinking about [the stolen bases] too much. He said, 'Let it come to you. Play the ball you've been playing and the stolen bases will come.' I did that, and it worked for me." In addition to his 100 stolen bases, Hamilton leads the Midwest League with 97 runs scored. His nearest competitors are Fort Wayne's Rymer Liriano, who has 65 steals, and Bowling Green's Cody Rogers, who's scored 89 runs. While stolen bases have been a constant, Hamilton struggled at the plate early in the season. Batting .215 at the end of May, he's turned things around over the final three-plus months, getting his average up to .278. Stalin Gerson (6-2) struck out six over five scoreless innings to earn the win. Mitch Clarke worked three frames before giving way to Pat Doyle, who struck out the side in the ninth to record his second save. The win was Dayton's 82nd, tying the single-season club record. David Schoenholtz is a contributor to MLB.com. This story was not subject to the approval of the National Association of Professional Baseball Leagues or its clubs.